Pulitzer Prize–winning journalist Maura McEnaney’s fascinating and wide-ranging biography of businessman and entrepreneur Willard Garvey is, in many ways, a history of 20th-century America itself. Having come of age during the Dust Bowl, Garvey rode the rails during the height of the Great Depression to work in the California orchards made famous by The Grapes of Wrath. He sailed the Queen Mary to fight in World War II, and was one of the first three American officers in Berlin after its fall, subsequently attending the Potsdam Conference. Upon returning to the United States, he found success in real estate and foreign investments and funded affordable housing projects from South America to Asia, all the while campaigning tirelessly for independent journalism and limited government at home. McEnaney presents an intimate, humanizing portrait of an individual who could very often seem larger than life and offers readers a story of American progress, devotion to family, and a drive for success. “Willard Garvey is an engaging and motivating story about a leader who made a real difference!” —Steven S. Reinemund, Dean, Wake Forest University School of Business; Retired Chairman and Chief Executive Officer, PepsiCo, Inc.
“As superbly presented in the book Willard Garvey, Willard was an innovator and a risk-taker, unafraid of failure or the lessons it could teach. 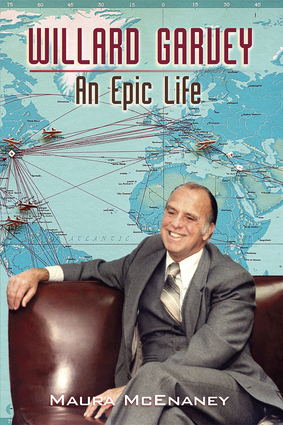 As this compelling biography demonstr ates, he was a man with the courage of his convictions—a trait our country so desperately needs at the present hour.” —Charles G. Koch, Chairman of the Board and Chief Executive Officer, Koch Industries, Inc.
Maura McEnaney is an award-winning business writer and editor with more than 30 years of experience. A former journalist at Bloomberg News and the Akron Beacon Journal, her work has appeared in the Boston Globe, the New York Daily News, and the Washington Post, among other publications. She was a staff writer on the Akron Beacon Journal’s “A Question of Color,” a year-long project examining race relations in Akron, which won the Pulitzer Prize Gold Medal for Meritorious Service. She has been a close friend of the Garvey family for more than two decades.